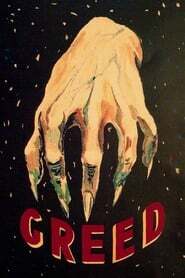 Greed is the classic 1924 silent film by Erich von Stroheim about a woman who wins the lottery thus becoming obsessed with money and ruining her marriage and the people around her. The film was originally 10 hours long and dramatically and realistically depicted word for word the Frank Norris novel McTeague. Only about 2 hours exist today as it is considered the 'Holy Grail' of lost films.